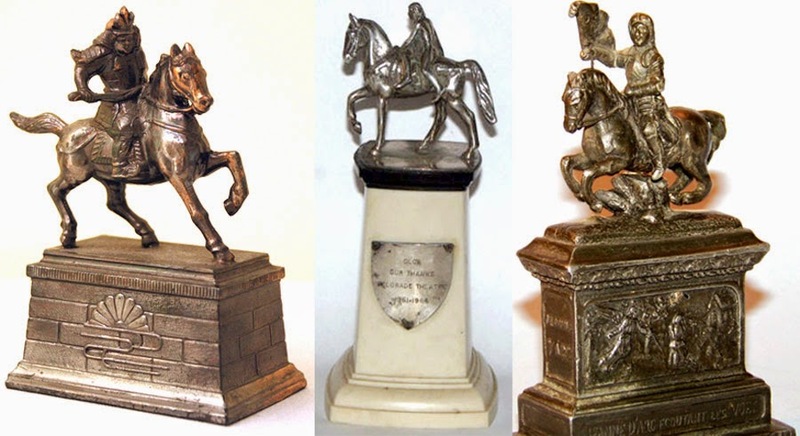 Napoleon, Joan of Arc, Paul Revere, George Washington and other military leaders have been memorialized atop a horse. 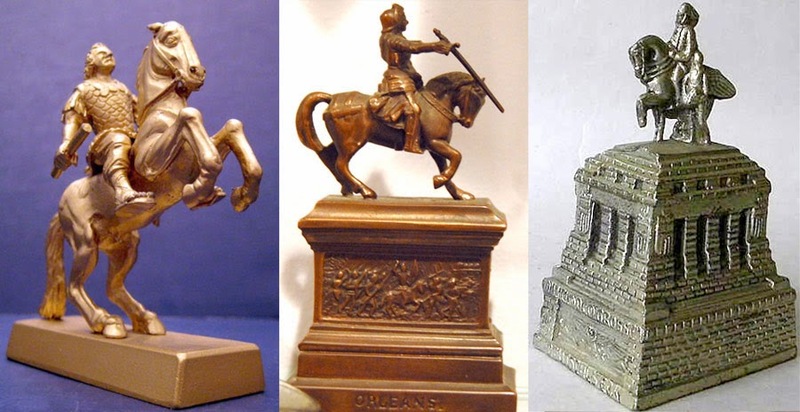 Some miniature replicas of these statues include a plinth or base to the monument, while others do not. Displayed here are some of the many variations of souvenir monuments and memorials to the mount and rider. The equestrian statue monument, with a horse-mounted rider, dates back to ancient Rome, when military leaders and emperors commissioned bronze statues to emphasize their leadership roles. The only remaining equestrian statue in Rome is that of Marcus Aurelius on Capitoline Hill. During the Renaissance, here was a resurgence of equestrian statues and the style made its way to the United States in the 1850’s. The art form became less popular when horses lost their status as work and war animals to mechanical forms of war in the 20th century. Ever wonder why the horses on monuments have different leg positions? There are many beliefs regarding horse statue memorials and the meaning of raised legs. Legend has it that if the horse has one leg raised, the rider was harmed during the battle. If the horse raised upright on its hind legs, the rider is said to have died in battle, and if all four hooves are on the ground, the rider survived the battle unharmed. While some statues do follow that tradition, maybe out of coincidence, many statues do not so this may just be a common misconception.